I started studying with the Open University when Toby was two weeks old, so the boys are used to seeing me working away on the computer when they've crept down the stairs unable to sleep, but until recently I have shied away from much computer-based learning for them. Under the age of two I don't think screens are healthy for kids, and over two years old an hour or two a day is plenty if they're not to be distracted from the really important job they have of physically playing. Now the boys are a bit bigger though, we have exchanged their hour of screen time watching TV for a really great online learning product. 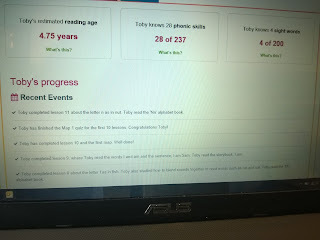 I had been hearing Reading Eggs mentioned regularly on Home Education forums for several months, and having decided to bring in some computer time I was really pleased to see that there was a two week free trial available. The process to sign up was really easy - no annoying long data gathering questionnaire, no requirement to hand over bank details, just a straight forward sign in. The company has also been really easy to contact and have responded quickly and positively to my queries, for example I was really happy to find out that there is a discount for Home Educators. The boys each received access to all three products available - Reading Eggs, Maths Seeds and Reading Eggspress. There were placement tests available to ensure the boys started off from a point appropriate to their abilities, but we could skip this and just start at lesson 1 for new learners, which we did for Toby. Reading Eggs is aimed at ages 3-7, Maths Seeds for 3-8, and Reading Eggspress for an older range of 7-13. For each program the children progress through a series of lessons which are all presented as games, with plenty of fun characters to meet along the way. It has been really valuable for review purposes to see Ollie and Toby working side by side as I cans see how the programs progress. For example Toby's games have more assistance in the form of most of the words being read out to him, while for Ollie there are more words which he has to decipher for himself. After completing the lesson games, the boys earn points which they can use to buy things for a virtual tree house or spend to play learning games in an arcade. They also have avatars for each program which they can personalise and use their points to buy clothes for. The range of activities available is excellent, including a library of books available for the level they are reading at, and the option to have it read out or not. A feature which we really liked was a story creation area where children using the program can write their own story and submit it to a competition where other users can read it and vote on it, or simply print it out for their own enjoyment. Until recently I mainly used work books for our sit down work time, plus various project books that the boys added to as we went along. This is good for learning how to write and physically holding a pen, but as I have to read out each task it made for a lot of 'Muuuum I've finished, now what' from one while I was midway through reading out the next task for the other so I usually ended up sending one to do jigsaws while I helped the other, then swapping over. 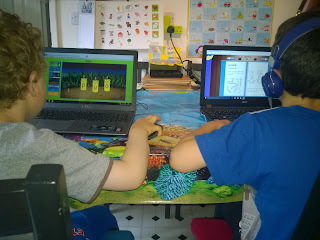 The benefit of the computer program is that it gives verbal instructions for how to complete each activity, and it is easy to click 'next' to move on to the next activity, so I can divide my time more easily between the boys. This in turn means that my time sat at the kitchen table has halved and we can use my freed up time for other activities such as more cooking and painting. Since I'm the kids' main teacher I have a really good insight into exactly what they excel at and where they need more support, but it was still very comforting to see the progress report from Reading Eggs which includes and estimate of the boys' reading ages. Toby is 4.5, with an estimated reading age of 4.75, while Ollie is 6.5 with an estimated reading age of 6. I was pleased with this range as Ollie has always preferred numbers to reading and only really started reading for himself at Christmas, so it was a nice confirmation of his growing confidence, while little Toby is desperate to catch his big brother up and read more books for himself. The reading ages are explained to be a 'starting point' and are not necessarily related to chronological age since young children master skills at very much their own pace in defiance of any average performance we can try to assign them, but it is useful to have a reading age to help chose appropriate reading material such as library books. 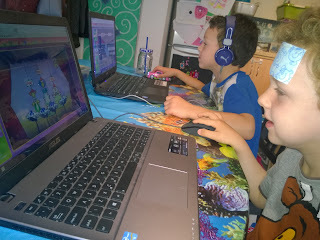 The formula of games for learning is a winning one as the boys both really want to get on to the computer to do their Reading Eggs and Maths Seeds. 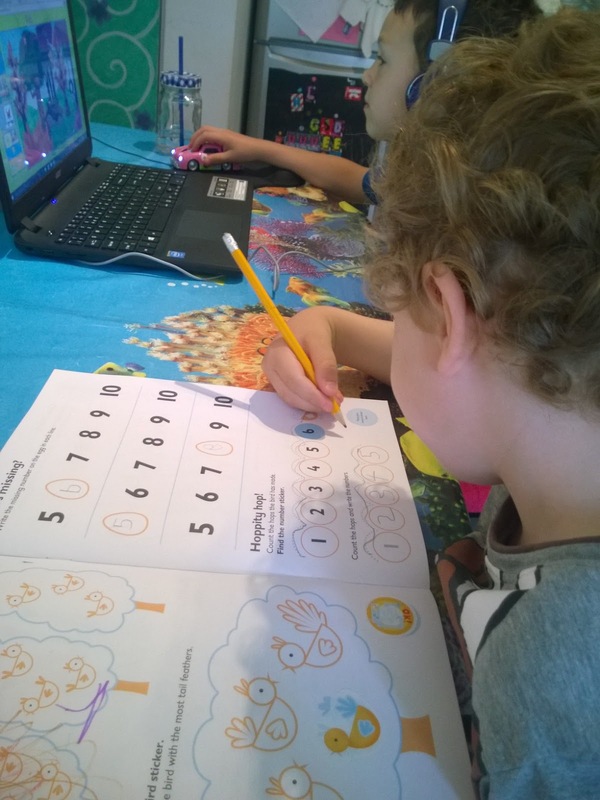 For the sake of reviewing we also tried Ollie out on Reading Eggspress, which is aimed at older children, and having completed Lesson 1 he gave it a big thumbs up and asked for more. In just over a week that we have been reviewing the programs we are already seeing big leaps in confidence and ability for both the boys (plus a couple of 'tech tantrums' from Toby when his hour was up and he wanted to play more). We have been ploughing through the programs at a lesson of each a day (Ollie is on Lesson 90 of 120 in Reading Eggs) because we are in the situation of having most mornings at home to do our 'school work', but I can see a year's subscription lasting well if I can encourage Ollie to spend more time exploring the other features such as the Story Lands, Spelling, Story Factory and Library. 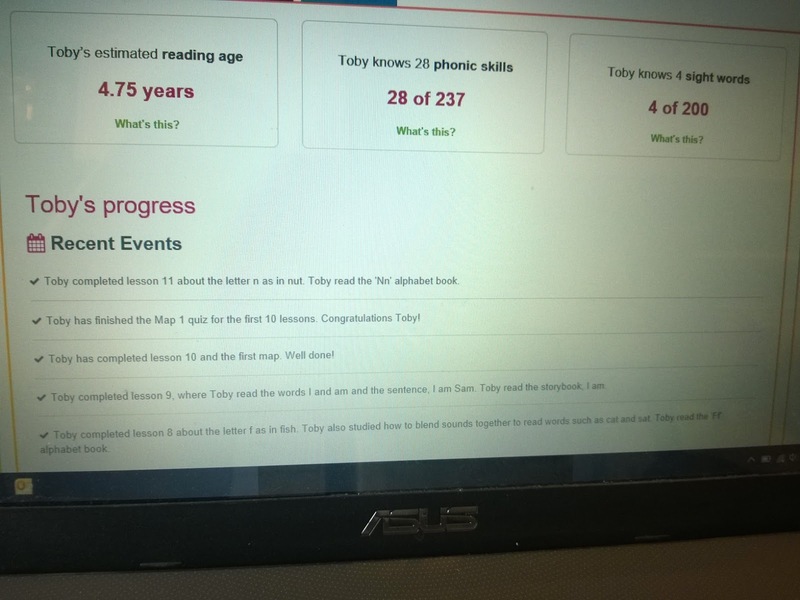 Alternatively if he continues to progress at his current pace he will be more than ready to switch to Reading Eggspress before we finish the extended trial which we were given in order to produce the blog review. For Toby, who started at Lesson 1 in both Reading eggs and Maths Seeds, we should get a really long use out of a subscription. When you subscribe for a year you chose which programs you require and are only charged for the ones you want, not all three if you don't require them, and after paying for a subscription for one child, any other children added receive a 50% family discount. Toby tends to get tired of using the mouse fairly quickly and prefers to point at the screen and get me to do the clicking (while grumbling about it not being a touch screen like his friends iPads - seriously, I'm getting grief from a 4 year old that our tech is too old fashioned! ), and the activities for his ability certainly seem set up to be perfect for touch screen devices. 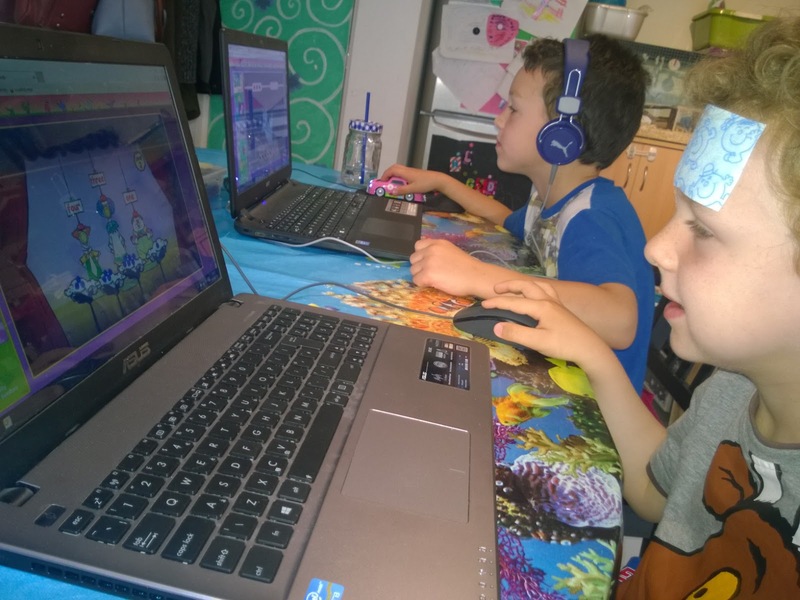 Because I'm doing the clicking, he has been finishing his lessons a bit ahead of Ollie, who has more time consuming tasks involving reading and typing as well as the quicker click and drag games. Toby has been using this time while Ollie is still on the computer to do a couple of pages from work books or to watch Ollie's progress and shout answers out, then they both go and play while I pack up the screens and set up the next activities. Later on we come back to the table to do some more workbooks or other writing activities and I have really noticed a difference in Ollie's confidence. Today his task was to write sentences describing pictures, and he flew through it with a 'this is fun mum' rather than the frustrated squeaking he made just a couple of weeks ago when asked to do a similar task. For home educators the benefit of a ready made program of activities is obvious, but seeing the rapid increase in the boys' confidence and their willingness to engage with the activities I think there are likely to be solid benefits to most families whether their children are home ed or schooled. The free trial certainly removes the uncertainty of whether it's worth subscribing and what to subscribe to - for example for some of our friends whose children are 5 or 6 and reading well above their age range they would rapidly see that the Reading Eggspress program is better suited for them. At the other end of the spectrum, for those who are struggling with their reading and maths, the reading age is only available for the adult to see from the Parent Dashboard, so there's no need for kids to feel embarrassed by using material labelled as being for younger children, and taking the initial short tests as part of a trial period can place them at the right level without shouting about whether they are at a particular age band or not. I haven't even covered a fraction of the things I have liked about Reading Eggs and Maths Seeds, so if you would like to look into it further then head over to their site for your own free trial, or comment below and I'll try to answer any questions you have. Toby has an odd sticker on his head in the photos because he had a cold and was a bit feverish - the sticker is a cooling strip. A good aspect of home ed is that if the kids are poorly, so long as they want to join in, they can carry on with our normal learning activities - in their pajamas even, although the option really is theirs when they're sick. We start at around 8am, and by the time they're getting to the end of their screen hour my locusts of children are hungry again, so the brown stuff in the cup in the bottom picture is avocado, banana and chocolate pudding. I got an extra long review time because having been impressed with our initial trial I contacted the company and asked if they would like me to provide a blog review, for which they added 5 weeks to the original 2 week trial period so I could really get to know the programs, plus an extra 3 weeks free as a thank you. All opinions, words and photos are my own.